"My experience was really good. I wasn't sure what all to expect but I trust my PCP so I knew it was going to go well. Dr. Pandit was very knowledgeable, listened well and was able to tell me exactly what needed to happen. He had a very organized treatment plan and from then on, it was constant communication in the best way possible. Staff called me on reminders, medications and it was a very personal touch. Once my plan was outlined, it went exactly how I expected and DENT did everything to make me as comfortable as possible"
"I was referred to Dallas ENT by my PCP because I had 6 sinus infections in 6 months! I've always lived with it and I've never seen an ENT before. So, I came in and did all the testing. Sinus surgery was recommended and I was completely on board. After surgery, now I know what it's like to finally breathe, smell, sleep, and enjoy food... I feel like a totally new person"
"I had a similar sinus surgery at 19 years old. I had good results but over time, the tissue became re-inflammed and soon, I couldn't breathe again. My allergies got worse and I was taking Zyrtec 2x a day. I was taking decongestants every day. I needed this to stop. How much medication do I need to take? My PCP told me to see an ENT specialist. I looked up Dr. Pandit and I came to see him at Dallas ENT. Dr. Pandit made me feel at peace when he gave me a structured and detailed plan. We did a scope, a CT and discussed the sinus surgery needed. His explanation of "why I was suffering" and the solution was fantastic. I was even excited to have the surgery done. The Methodist Addison facility where I had the surgery done was perfection and streamlined. Now, I can breathe and sleeping deeper naturally. I have reduced many different medications by just breathing, lowering stress and taking better care of myself." "I was recommended to Dr. Pandit by a co-worker who also had sinus issues and was treated by Dr. Pandit. I called Dallas ENT the same day and made an appointment. When I came in, everyone was very thorough with the CT scan and scope. I was told that my left side of my nose was completely deviated and also had sinus congestion. I had a septoplasty followed by the in-office balloon sinuplasty. Both procedures went very well. The staff called to make sure I was ok and that I had no pain. I have had no issues since. I am able to breathe so much better. I love that Dr. Pandit explains everything straight to the point. He doesn't beat around the bush and tells you exactly what I needed to do to feel better. I also had allergy testing done today and I look forward to getting my allergy shots . Every staff member cares about you just the right amount. It's been a wonderful experience." "I could not breathe. I've had sinus problems my entire life. I went to my PCP and we tried a number of things that did not work and then he referred me to Dr. Pandit. I had another friend who also had sinus surgery but his recovery included 2 black eyes and being in bed for about 36 hours. I had a 4.5cm growth in my nose and needed it removed. I also needed sinus surgery. I was anticipating a much longer recovery but I had no pain, no black eyes and was never laid up. I even went out to eat afterwards and have done a few trips immediately following the surgery. This is a true sign of the technical proficiency of Dr. Pandit and the entire staff at Dallas ENT. This is my very first surgery I've ever had and I'm 52!" "I came to see Dr. Pandit through a family friend recommendation. The staff at Dallas ENT is incredible, very organized and on point. You can call and they all know the answer, it's on their fingertips. The staff isn't just on top of clinical questions but also on insurance and administrative issues. The billing team was amazing, they kept me up to date on the entire authorization process and every single update to make sure I was taken care of financially. Dr. Pandit is very thorough and made sure that I understood the process and procedure. He recommended allergy testing and the balloon sinuplasty. Who knew I was allergic to so many things? Now, I have a very comprehensive treatment plan to take care of my sinuses and allergy issues. I constantly check pollen.com now." "I loved the fact that Dr. Pandit and his whole team worked with me to figure out the best way to address my health issues which were primarily allergies and sinus concerns. They really stepped me through my treatment plan. First we started with allergy testing and once that was under control, we looked at how to better my lifestyle. He recommended the air purifier, staying disciplined with my allergy medicines and then we pursued surgery eventually but that was never the first option. The balloon sinuplasty was fantastic, painless and I am yet to even take Tylenol. I was very informed and I knew the team were my advocates and always had my best interests in mind." "I found Dr. Pandit in the MHD Shine article that featured Roger Daltrey and voice disorders. I saved the article over a year because I had been struggling with talking, breathing and hoarseness for a while and finally made an appointment. Dr. Pandit found large non-cancerous polyps that were blocking over 80% of my airway. He removed them surgically and I cannot tell you what a life changer this has been. Dr. Pandit has the best bedside manners and is a wonderful listener. Everyone, the entire staff at Dallas ENT goes above and beyond, nothing like I've ever seen. I will be recommending you all." "I've lived all over the country, all over the world but I have never suffered from allergies. In high school, I started having seasonal allergies and working outside made it so worse. I have been to the ER multiple times. Moving to TX, I stabilized for about 20 years but recently, it has sprouted back up again and I have suffered from sinus infections almost every month. I have become an avid Afrin user, my PCPs never told me about seeing an ENT and then I heard about Dr. Pandit on TV. I called his office and made an appointment that day. I came in, got a CT scan, scope and got a treatment plan immediately. I had a septoplasty, balloon sinuplasty and now am on immunotherapy. My healing process is going well and I can finally breathe through my nose without using Afrin. I wish I had done this 25 years ago!" "I found Dr. Pandit through the internet, read the reviews and was very encouraged to see that he has been part of the MHD system for a long time. My experience was wonderful! I met with the PA first and she was able to explain tonsil stones to me and surgical options. Dr. Pandit also consulted with me and assured me that the surgery will be a success. I worked with the staff to schedule my surgery and it was wonderful and convenient. Dr. Pandit and the anesthesia team talked me through the surgery and post-surgical care process/expectations. Dr. Pandit took his time to talk to me, he was amazing, perfect bedside manners and made my parents feel very comfortable. I healed very well and am no longer on medications. The experience and everyone here has been wonderful. I even got calls after my surgery to make sure I was doing ok"
"I used to carry a big bag of medicine around. I used to always be at PCP or CareNow but I finally found Dallas ENT. I was able to get in a lot faster than expected, showed them my medications and as part of my consult we did a CT scan and holy cannoli - my septum and sinuses were terrible! Dr. Pandit recommended a medication therapy and sinus surgery. He explained the surgical process very well and since then, I feel like I have a new nose. I am shocked at how well I could have been breathing my whole life"
"I used to be a runner but with my nasal/sinus issues, I barely could run anymore. I used to get infections almost every other month. I went to nursing school and knew I had to take this problem taken care of. I went to see another ENT but didn't have a good experience. Then, I was told about Dr. Pandit and my experience was so different. At Dallas ENT, they value educating you, everyone is very sincere and caring but most important, I felt very safe"
"I am absolutely astounded... I have had 2 previous surgeries for the exact same problem and the sinus issues that I had never went away. I have never been able to sleep through the night till now! After my surgery with Dr. Pandit, I have been able to sleep all night long, no nasal problems at all and I look forward to such a better quality of life. Dr. Pandit is a miracle worker and I have the highest of praises for him. I cannot belive how Dr. Pandit and his clinical team worked through their diagnosis, they weren't interested in just fixing the problem, they were focused on the root cause of the problem so I would be able to end my sinus suffering. I would recommend Dallas ENT to anyone with sinus issues. This office staff and physician is one of the best." "I came to Dr. Pandit by word of mouth. I had several friends go to him and highly recommended him. My initial impression was very good, Dr. Pandit was very thorough and answered all my questions. I appreciated his straight forwardness and honesty. He laid out all my options and walked me through everything. His staff is amazing, very responsive and just put me at ease . I was able to see Dr. Pandit within 3 days of my call to him and I was so appreciative because they knew I needed to see him as soon as possible. As a medical professional, I really admire Dr. Pandit's clinical expertise and his staff's patient care. I am very grateful to Dallas ENT and will definitely refer all my friends and family to him." "I had a broken nose that had gone untreated since my teenage years. I have suffered with sinusitis, infections, pressure, headaches, you name it through my 20s and into my 30s. My PCP had treated me for my sinus infections 2 - 3 times a year and then referred me. I had a septoplasty and the in-office balloon procedures. I immediately felt relief! Since having the procedure, I have slept better, wake up easier, have more energy and even contemplating working out more." "Overall a great experience. Things at Dallas ENT were very well explained and felt easy. The operations and logistics are seamless. The staff is very relatable, outgoing and go out of their way to make you feel comfortable. There is absolutely no 'procedural red tape', no wait and my time is respected. On that note, scheduling is very efficient and flexible. I had a septoplasty, balloon sinuplasty and SMR and the results were phenomenal with no complications. Overall very happy with my lifestyle changes." "My physician recommended another ENT to me but when I went to see him, I was scared with his approach. Several years later, I started researching again online more in-depth and I found that Dr. Pandit was one of the best rated sinus surgeons in Dallas. When I met with Dr. Pandit, I was extremely pleased. He did a complete consultation and explained everything very well. The reviews that I read matched my experience at Dallas ENT. I am very happy with my decision. Dr. Pandit is a master craftsman at what he does and I rave about everyone here all the time. I had a septoplasty done and I had a great recovery with no bruising or discomfort." "I came to Dr. Pandit because I was looking for a 2nd opinion. I looked on the internet reviews, D Magazine and also our insurance listed him as preferred. When I made an appointment, the staff was very accommodative and they worked with my schedule and I had an appointment right away. For people who had never met me, they were so wonderful. I was very impressed with the clinical team as they assessed me - so patient, knowledgeable and their training shined through. They showed me videos of the surgery and it was very helpful. Then, when I saw Dr. Pandit, he spent time with me explaining everything in a way I understood, lamens term. After reviewing the CT scan, he recommended the balloon sinuplasty. Dr. Pandit and his PA, Jillian explained everything so clearly to me and how it was related to all the symptoms I was having. I couldn't have been more impressed! After I met Dr. Pandit and saw how fantastic he was, it's so clear why he also has such amazing staff. I had the procedure in the office, I was relaxed, very informed and the experience was smooth and painless. The staff called me the next day to check up on me which was wonderful. My recovery was amazing, no packing, no stress, nothing!" "For the last five years, I forgot what it felt like to not have sinus pressure on a daily basis. I learned to live with it, but ever since I had my balloon procedure my life has been changed. I feel like a whole new person, and couldn’t have asked for a better experience. He was very knowledgeable, friendly, and a great surgeon. His staff is friendly, kind, attentive and they really took great care of me. I would recommend him to everyone." "I'm 10 years old. I was nervous at first when I was getting ready for adenoidectomy surgery. I asked for the anesthesia mask so I could calm myself down. I smelled perfume and I went to sleep because after that I don't remember anything. Dr. Pandit explained my surgery to me so well and so I knew everything that was going to happen. He told me not to worry about anything and he even joked with me. When I woke up after my surgery, my throat hurt but I got to eat 2 popsicles, jello and juice. I threw up a little but as soon as I got home, I was tuckered out and went to sleep. I am so happy I came here and met all of you. Thank you for making me feel better. I start school tomorrow and I'm so happy!" "I have always had sinus issues. I went to another ENT and he sent me to get a CT and to see a sinus specialist. I went to another sinus specialist but he said he couldn't do anything. Then, I heard about Dr. Pandit and also remembered that I saw him on TV. Immediately, after my consult, he knew what to do and had me on a treatment plan. I had the sinus surgery with stealth at Methodist Addison and I was very impressed. I am the biggest worrier there is but as Dr. Pandit explained the surgery, my worries went away and I was very comfortable in his hands. I have to say that this is the most friendliest, efficient, caring, compassionate doctors office I have been to in my 62 years of life. Everything is perfect here, every one of my questions is always answered and I have nothing but high praises. I have recommended him to many dear friends. Dr. Pandit has the best bed side manners too!" "My PCP referred me to Dr. Pandit and when I first came in and had my consultation, I knew what I had to do. I am a very busy person and I knew I had to feel better. Till I had the work up with Dr. Pandit, I have been given medication after medication but no one had recommended surgery. Immediately, after surgery, I have felt better. Every time I come in here, I know it was a great decision. Everyone I've met and worked with has been exceptional. Even when I'm late, they work with me and make my health important. I am so glad I was referred to Dallas ENT. Now, that I've had surgery and taken care of my sinus issues, I also realized with the help of Dr. Pandit and their allergy technician, that I needed immunotherapy as well to remain sinus and allergy free." "I have had sinus issues for years and was recommended to Dr. Pandit. I was always having breathing issues and congestion so I finally called and came in. After a CT, I was given a detailed treatment plan that included the sinus balloon and surgery. Now, I can breathe and it's almost overwhelming.... I can breathe the grass, flowers and everything around me. The staff at Dallas ENT always went overboard and their patient care is exceptional. They always remember my name and are very knowledgeable. They even took great care of me after my surgery and have held my hand every step of the way. Even when Dr. Pandit was out of the office, he called me right away and I couldn't believe it. Every person in Dallas ENT, even though it's a very medical professional environment, you will not feel it here because every single person treats you like a human and part of a big family. You just know that everyone here not only loves what they do but they love who they are doing it with." "I had surgery by Dr. Pandit, and then an in-office balloon procedure and now am going through immunotherapy with Dallas ENT. I've been very happy with the level of professionalism and courtesy of every single employee. I've never had to wait more than 5 minutes for anything. The office is very clean and gives off a great impression. Dr. Pandit is great at explaining the procedure, treatment plan and what to expect. Everyone at Dallas ENT goes out of their way to make you really comfortable. Their patient care and service is unbelievable. I can breathe better than I ever have before and couldn't be happier." "I was referred to Dr. Pandit by my PCP and upon meeting Dr. Pandit, he was very down to earth and personable in immediately explaining to me what my diagnosis and treatment would be. Also, extremely important was that the office staff was very timely, knowledgeable and thorough in their care for me. Appointments were always on time, finances were explained thoroughly and the actual procedure was very smooth and successful. I can breathe again and don't wake everyone up around me." "I knew there was something wrong with my son. I even fired my pediatrician. My son was in pain and could barely breathe. I found Dr. Pandit via internet searches and read great reviews. Once I called the office, I knew I had come to the right place. They made me an appointment right away. Dr. Pandit is an amazing doctor and am very thankful to have him as my ENT. He has excellent bedside manners and gives you his one on one full attention. He knew instantly what was wrong with my son and gave me the confidence to move forward with surgery. Since the day of the surgery, my baby is happy and that's all that matters. I would definitely recommend Dr. Pandit and Dallas ENT to anybody, adults or children." "I have had a deviated septum for years and I finally found Dr. Pandit. Online, I found that he had a lot of great reviews and I felt extremely confident before even stepping into the office. Dr. Pandit showed me a video of the surgery and I was very well informed and taken care of. Dallas ENT's use of technology and staying in the forefront of medical science is truly remarkable. He set the right expectations and his diagnosis and treatment plan were right on. I sound so much better, less nasal sounding and my snoring has gone away. I really appreciate everyone at Dallas ENT as they kept me educated and comfortable through the entire process"
"I had been struggling with sinus headaches for four long years. I had torturing pain behind my eyes, frontal sinuses (forehead), and my maxillary sinuses (cheeks). I had been to several ENT's throughout the years, and no one could ever diagnose me. I had several doctors tell me it's allergies, so they would just give me allergy shots one a week. That went on a good year and a half. No pain seemed to go away! I tried all kinds of nasal sprays, inhalers, over the counter medicine, and humidifiers. Nothing worked! I finally found a procedure online that Dr. Pandit specializes in, the balloon sinuplasty procedure. Dr. Pandit and Dr. Pam encouraged me to get my deviated septum fixed along with the balloon procedure. They really felt that I was suffering through all this pain from my deviated septum. I felt like there was finally hope! I decided to only get the balloon procedure done because I could stay awake through the procedure. I thought I would try it first. I had the EASY balloon procedure done, and I felt some relief, especially on my left side. My right side (deviated septum side) continued to hurt. One day, I was in so much pain that I called right then and made an appointment for the deviated septum surgery. I had the surgery a few weeks ago, and I am doing great! I have only had a few headaches, but they were from the soreness of the surgery. I would recommend having the deviated septum surgery done by Dr. Pandit and his team. I loved that I didn't have to have that terrible packing people always spoke about! The recovery was simple and short. Most importantly, I recommend Dr. Pandit, Dr. Pam, and his team because of how well they took care of me. The first day I met Dr. Pandit, he was very concerned for my well being and wanted to make things right for me. He also noticed that my heart rate was very fast. I already knew that, but he was the ONLY doctor who had ever said anything to me about it. I was impressed! They always made me feel like I was their only patient. That's what kind of doctors I want!" "I had sinus surgery about 5 years ago and I needed to have it re-done because I believe it was of the lack of quality care and follow through. I found Dr. Pandit and realized very quickly that he was very knowledgeable, caring, down to earth and had only my interest in mind. I religiously do everything Dr. Pandit tells me to do. I have already told my friends and family about Dallas ENT and now will be writing reviews everywhere. There are about 10 ENTs between where I live and Dr. Pandit's office but as soon as I stepped in here, I knew I was in the right place! The entire team is the best medical practice I have ever seen, top to bottom." "From the moment you walk in, you feel very welcome here at Dallas ENT and that first impression carries with you through out your visit. Every staff member up to Dr. Pandit is very professional and friendly. When you meet Dr. Pandit, like me, you will instantly know that he wants to help you feel better, explore various treatment options so you can have a better quality of life. Dr. Pandit is very youthful, up to date with the latest technologies and extremely knowledgeable. I had consulted another ENT before and I was very disheartened by his diagnosis that there was nothing that can be done and that this was something that "I just had to live with". As an ER nurse, I know that a good characteristic for a physician is to not close off options but instead to have the desire and quest for knowledge. With Dr. Pandit, his PA, and all their staff, you will see instantly that their curiosity for learning is the secret of their success! I am happy that I persevered beyond my initial diagnosis and found Dallas ENT." "As a Dallas Zoo employee, I am very exposed to grains, hays, cottonwood, ragweed and over the years have developed chronic sinusitis and allergies. I recently had the in-office balloon and it was easier and smoother than I ever imagined. Believe it or not, I had it done on Christmas Eve and that shows the dedication of the physicians and staff at Dallas ENT to be taking care of patients during the holiday season! The patience and knowledge that everyone has was unbelievably impressive as I was your typical nervous patient. When Dr. Pandit came in and talked to me, it was like I was the only person in his office, his individual attention towards my care won my heart. After that, I had extreme confidence in Dallas ENT and every single staff member there. They answered every question I had, worked with my schedule, helped me with my payments and I couldn't believe it. My post-op care was exceptional and would recommend Dr. Pandit to everyone!" "The staff, overall was extremely professional and pleasant. They worked with my travel schedule to make sure I was seen to my convenience and I very much appreciate that. Everyone spoke and interacted with me as a person and not just a patient! 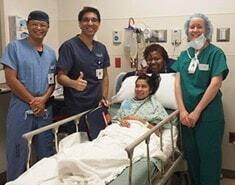 I had a septoplasty and SMR at the Methodist Addison Surgery Center after consulting with Dr. Pandit and Pam. The surgery was a very smooth experience and I felt that I was under professional and quality care from the moment I checked into the facility to the moment I was sent home. I really appreciated that Dr. Pandit visited with me as he reviewed what was going to happen and I was very comfortable with my care. I had my surgery on a Friday, followed up on Monday where they removed the stents and it was a great planned out experience. I followed up as needed to make sure I was healing properly and followed directions accordingly. I reported symptoms of sleep apnea in one of my visits and I had a home sleep study done. I was happy with the review of results where it was determined that it would be used as a baseline for any future symptoms. It was nice to know that this test wasn't done to sell me on any products or services but to provide me with the appropriate clinical care needed. I also really appreciate the collaboration and cohesive care with Dr. Pandit's office, my PCP and allergist." "I've been very apprehensive for many years to have a tonsillectomy and when I met Dr. Pandit I was very impressed. He explained the surgery, risks and recovery very honestly and forthright, basically no nonsense. I felt very comfortable and everything he told me was reality. I was able to be diagnosed and treated very quickly. His PA was extremely helpful post-op by assisting with my medications and recovery. I have never had any surgery before, ever, and I was very nervous but Dr. Pandit, OR staff and anesthesiologist were amazing and I was so much more at ease before the procedure." "I have been snoring for the last 15 years. My wife almost gave up on me. Finally, after I got a sleep study done, the doctor told me to go see Dr. Pandit because he was the best. And, I have to tell you, he is the BEST! I had surgery by him and within one week, my life has changed. It is amazing what proper sleep can do for you. My trainer is so excited for me because my body is resting, healing and ready to get stronger now. When me and my buddies go hunting, I have graduated from the "snoring" room to the "non-snoring" room. My friends couldn't believe the dramatic change as they have been used to my snoring for over 10 years. I have already told several people to come to Dallas ENT and told them that their life is going to change. The staff is so friendly and knowledgeable. Pam, their PA, even called me several times to check in on me and make sure I was no longer in pain." "Over the last 2 summers, I have been suffering with sinus headaches, migraines and congestion. It was affecting my abilities at work and overall lifestyle and I wanted to take care of it. I did online research and found Dr. Pandit's office. He was well recognized for the in-office balloon procedure, had been well received by patient awards, especially D magazine. I came in to the office, had a CT scan and was scheduled for the procedure. Within a week, I feel much better and like a whole new person. The whole experience was seamless and although I was hesitant initially, it was the best decision I ever made." "I have been a sinus sufferer for as long as I can remember and why didn't I take care of myself earlier? I am 83 years old now. I finally was referred to Dr. Pandit and had sinus surgery. Immediately, I felt better and my life has turned around. Take care of your sinus issues! I am so glad that Dr. Pandit and the staff took the time to find the best solution for me. Everyone should come to Dallas ENT, you will love your experience and the staff!" "My wife has been complaining about my snoring for a very long time and I finally decided to take care of it. I had a sleep study done, found out that I had mild sleep apnea but my primary problem was not being able to breathe properly. I saw Dr. Pandit and he recommended in-office balloon sinus procedure. Within the first couple weeks, I felt much better and can finally breathe well. The office is extremely nice, great location, easy going and really wants to take care of you." "I've been a migraine and chronic sinus sufferer for at least 10 years. Although I somehow managed to go to work, I would have migraines for at least 5 days a week and was very dehabilitated. What I realized soon was that it was really a sinus headache from all the pressure that I was truly suffering from. I recently had sinus surgery with Dr. Pandit and a couple days later, I was a new person. I felt like I was given the gift of my life back. The staff was amazing - everyone was very knowledgeable and informative; from the person who checked me in to the person who scheduled surgery and everyone else as well." "I've suffered from sinus problems for over 20 years to a point that my teeth began to ache. I had the in-office balloon procedure and less than a week later, the pain diminished quite a bit. I had been to two separate dentists in the past but was told I had no teeth issues and most likely it's my sinuses. Then, I did some research on my own and looked into several physicians and found that Dr. Pandit was the best out there with his results and patient feedback. The whole process was so easy due to the professionalism of the entire office staff. Everyone was very informative, nice and a very overall pleasant environment. " "For the last 20 years, I have suffered with sinus and allergy but have managed with nasal sprays. 6 months ago, I had enough and was referred to Dr. Pandit. It was the best decision I ever made. I recently had the in-office balloon procedure and recommend it very highly. It has transformed my life. A little discomfort but very worth it, kind of like going to the dentist! As a retired nurse, I have very high expectations for my clinical care. All the staff at Dallas ENT was very knowledgeable and friendly and I had a great experience. I would highly recommend this office for any of your ENT problems. " "My experience with Dallas ENT has been extremely professional from start to finish. I have been a sinus/allergy sufferer for over 50 years, even seeing an allergist. Finally, I was sent to see an ENT and I selected Dr. Pandit, who came very highly recommended. The clinical results have met all my expectations. All my questions have been answered and with the confidence and candor that I expected. I was very pleased with the care I received and would refer all my friends and family to you." "My experience with Dallas ENT has been such a life changing event for me. Dr. Pandit, Marylyn Koble and the staff are amazing! I have been dealing with a hearing loss for quite some time and just always compensated for the loss. I started a new job and realized that I could no longer go without having it checked. I was able to get an appointment quickly, which eased my anxiety a bit. After thorough testing and exams, Dr. Pandit and Marylyn Koble spent the time to explain my hearing loss and gave me a recommendation to get fitted for hearing aids. I appreciated that there was no pressure to make a decision and I was given information to read later, when I was ready. Shortly afterwards, I made a follow-up appointment with Marylyn. It was the best decision I have made in a long time. The moment Marylyn put my hearing aids on, my world changed. I never knew how much I was missing in life! Marylyn took time during our appointments to make sure I was educated on the use and cleaning of my new aids. Knowledge is power!!!! Dr. Pandit and his staff are absolutely the best! I would highly recommend Dallas ENT - they ROCK!" "Coming here is just like going to Cheers, 'where everybody is my friend'. I have had sinus issues for over 20 years. I finally got my deviated septum fixed, found out I had additional sinus issues and got everything taken care of. The quality of care was so great that I also brought my grandson to see Dr. Pandit and Pam. I have recommended this office to quite a few people and will continue to do so. I even managed to get hearing aids (Resound), the kind that works with my iPhone and that has completely changed my life. I cannot thank Marylyn enough. " "Dr. Pandit's team is the best I've ever had in my life. I would highly recommend him to anyone, as a matter of fact, I've already told people about him. The whole team in the office and the hospital was outstanding. I couldn't have asked for surgical better care. " "I always have a pleasant experience whenever I come into your office. I never have to wait long and the staff is always so attentive and kind. Unfortunately, I don't have this experience with any other doctors we go to." "Just wanted to share a photo, Dr. Pandit and all his staff are amazing. Great service from the inital phone call to schedule to the day of surgery. Pamela Rebeles took the time to answer my questions, his PA comforted my daughter and called again for any follow up questions. Day of surgery Dr. Pandit explained again and spoke directly to my daughter to make sure she was comfortable. Thank you all. Amazing dr and staff." "My experiences with Dr. Pandit and his staff have been fantastic. I have dealt with allergies and clogged sinus passages for years. I appreciate Dr. Pandit's thorough approach and his thoughtful discussion of all options. After our conversation, I opted for the balloon sinuplasty. The fact that it could be done in the office was a huge plus. The procedure itself was painless. Within a couple of hours I was back to normal and breathing better than I had in several years. I would - and have - recommended seeing Dr. Pandit to family and friends. Every encounter has been a great experience." "Please allow me to describe my recent experiences, when visiting Dr. Pandit's office, at Methodist Hospital. To start off, I was seen right on schedule on every visit and that is something that doesn't seem to happen at most doctor's offices. Second, I was clearly educated by Dr. Pandit about his diagnosis and what his tests revealed about my symptoms and condition. He next described what procedural options were available, the pros and cons of each, and then his recommendation based on his experience. I felt immense confidence when it came time to make a decision about which procedure to go with. As if all these issues weren't enough to make me a big fan, I also had several sessions with his audiologist and PA. Both were as experienced and knowledgeable as anyone could ever want, making every visit a positive step towards resolving my issues. Everyone in the office was so kind, helpful and professional. What an incredible team he has. I really can't recall a more pleasant and successful, medical experience. Please pass along my gratitude to Dr. Pandit and his entire staff. " "It is amazing how we take breathing for granted. I had been struggling to breathe for a while and brushed it off as severe allergies. My life changed just a few weeks ago when I visited with Dr. Pandit and his staff. During my appointment, the staff took time to explain what was going on with my sinuses and I was able to understand how critical my condition was. I would have never thought that my nose was complete blocked with polyps and that there was no significant air flow. Now after my surgery my whole world has changed. Just hours after surgery I saw improvement in my breathing. I am now able to breathe clearly, my sleep has improved, I can chase after my toddler with out concern and even my students have noticed a change in my breathing. Thank you for saving my life Dallas ENT!!" "I would like to share how my recent balloon sinus procedure improved my quality of life. After suffering with continual sinus infections my doctor referred me to Dr. Pandit. Upon examination and testing he concluded that I was a good candidate for this procedure. My insurance company was making him jump through hoops as they believed this procedure was not medically necessary. I was experiencing headaches, blurred vision, sleep difficulties, fatigue, sinus pain and horrible snoring. On bad days I would struggle with vertigo. Dr. Pandit and his team did not give up and finally the procedure was approved by my insurance company. The procedure went well and I was at work within 48 hours. I did not realize how my breathing was affected as I have suffered with sinus problems all my life. The one thing I had to get accustomed to was the ability to drink and breath at the same time. This may seem inconsequential but it made me realize how bad things had been and how great it feels to be able to do something that most take for granted. I don't wake up with headaches and sinus pressure or pain! My husband and I now get a good night sleep. I would highly recommend Dr. Pandit and his staff to everyone struggling with sinus problems." "My experience with Dallas ENT and Dr. Pandit was top notch. All visits prior to surgery for septoplasty and turbinate reduction surgery answered all my questions and concerns. The surgery itself was a snap and I experienced very little to no pain in post-op recovery. The swelling is still going down, but I can tell I am on the way to breathing better with fewer sinus infections. I will definitely use Dallas ENT and Dr. Pandit for any futures issues I have." "From my first appointment to my final follow up visit, the whole team from reception to Dr. Pandit was amazing. They originally performed surgery on my son when he was 2 years old and I was so impressed with their team that I decided to go Dallas ENT as well for my sinus and sleep apnea issues. If I or anyone else in my family has the need for an ENT doctor, I will not hesitate to recommend Dr. Pandit and the rest of the staff at Dallas ENT because, in my opinion, they are the best in Dallas." "When Mrs. Hale decided to have the Balloon Sinuplasty procedure done, she also decided to put it to the ultimate test. I was going to China two weeks after the procedure with my son and his wife to adopt my new 9-month old granddaughter. I discussed my plans with Dr. Pandit and felt confident that I could make the long trip to a foreign country without any problems. And it turns out I was right. I did great. No problems whatsoever! This procedure is revolutionary. I can't tell you how much better it is and how much better I feel. It's made a world of difference. And I was able to attend my grandson's baseball game the very next day after surgery. I had four or five surgeries to clear up sinus infections. I just became accustomed to dealing with the discomfort. This procedure is revolutionary and I was very confident in Dr. Pandit's diagnosis. I can't tell you how much better it is after having the balloon sinuplasty. And I was able to attend my grandson's baseball game the very next day after surgery." "I have not had a single sinus infection since I had the laser turbinate surgery, so it's been a godsend and an answer to many prayers. With this procedure, Dr. Pandit has really changed my life." "I am just so happy that there is a cure. I have suffered with this for so long, always having to clear my throat and dealing with post nasal drip. It is a very uncomfortable feeling. Dr. Pandit, with the latest technology, was able to diagnose me, put me on a short term treatment and advise me on diet. I am truly grateful." "She doesn't have to wake me up or leave the bedroom anymore. I had the revolutionary pillar procedure and it has transformed my life, my marriage and my spirit!" Couldn't use a cell phone without receiving buzzing noise. The hole to the speakers would become clogged with ear wax and I would need to clean them several times a day. Being in the ear, perspiration could not escape from my ears, thus causing my ears to itch continually. Either one or the other aid was in for repair about every other month, and either the speaker or the receiver would need replaced. When I spoke, it sounded like I was in a barrel/echo. My ears would become tired from having something in them, and it was a relief after work and on week ends not to wear them. There have been a couple of times when I was bumped on the ear and with the "in the canal" hearing aid, my ear did not have any flexibility and the inside of my ear was bruised, and I could not wear that aid for a couple of weeks waiting for my ear to heal. The inter canal to my ear received pressure from the aid, thus beginning to stretch the inter canal, and I found that the aids began to "fall out" more easily. When I received your invitation in the mail to meet with you to discuss Oticon hearing aids, I did not give much thought to it even though you were offering a special along with the opportunity to meet with a factory rep. I didn't want to spend more money to repeat the same issues. When I met with you and the manufactures rep and you placed a set of Oticon aids on/in my ears, I could hear the difference I had been missing. With these aids, all of the above issues I was experiencing were eliminated. I truly am hearing now, even though I thought that I was previously with my old aids. Thanks for your professionalism and for caring." "Thanks to Paul Stephenson and Dallas ENT, I can hear again. My ability to hear was deteriorating to the point that it was becoming embarrassing. I was constantly having to ask people to repeat what they had said and then apologize that I couldn't hear as well as I used to. Paul and Oticon have changed all that. Thanks, Paul!" "I am 80 years old. I have had a hearing problem since I was involve in an explosion in 1974. I have been fitted with several different hearing aids since that date, none of which provided normal hearing or satisfying comfort. In early 2008, several business associates (customers of Paul Stephenson of Dallas ENT) recommended I go see him. Paul did a hearing test, fitted me with a set of hearing aids and that began my new life. I am totally satisfied with Dallas ENT's hearing aid and audiology services. I highly recommend anyone with a hearing problems go see Paul. I wish I had met Paul 34 years ago." 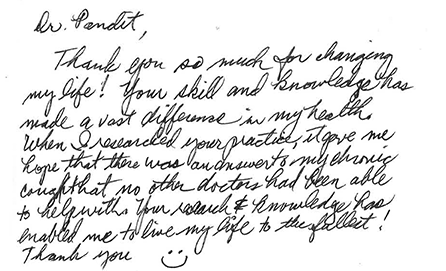 "Dr. Pandit, thank you so much for changing my life! Your skill and knowledge has made a vast difference in my health. When i researched your practice, it gave me hope that there was an answer to my chronic cough that no other doctors had been able to help with. Your research and knowledge has enabled me to live my life to the fullest! Thank you."